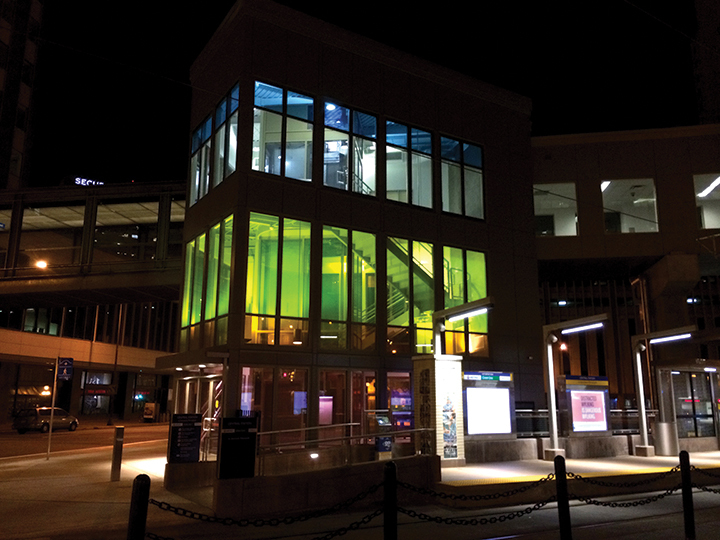 In 2009, the City of Saint Paul enacted a groundbreaking public art ordinance that requires planning teams to include artists as well as funds public art for City-owned capital projects. However, no provisions were made for administering the ordinance, so Public Art Saint Paul (PASP), a private non-profit organization that frequently collaborates with the City, stepped in to fund an administrative position. PASP engaged me to operationalize the city’s ordinance. Working out of the City's Office of Financial Services Design Section, I led a Public Art Working Group composed of city staff from all departments and devised Program Guidelines and a Technical Manual informed by ongoing city procedures and ways of doing business. 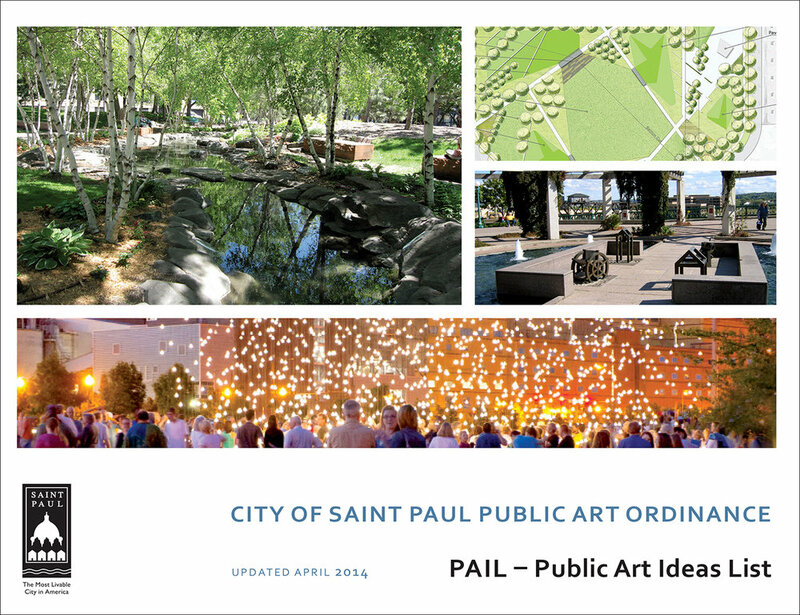 I also created the Public Art Ideas List (PAIL) publication, an encyclopedic resource with inspiring examples, and through an open call, populated the City List of Qualified Public Artists called for in the ordinance. I provided project management for several ordinance-funded public art projects and for PASP’s City Artist team working on the Public Works’ Residential Street Vitality Program (RSVP) Public Art Pilot. The City Artist team created ironwork stop sign posts, rain garden sculptures and sidewalk poetry sited throughout the city. I reported to PASP and an Oversight Committee composed of City department heads and arts leaders. 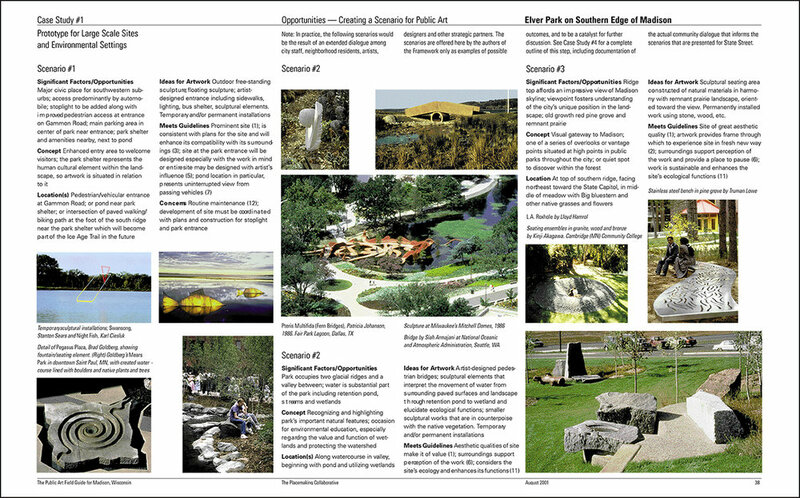 The Field Guide portion that I authored for the Madison Arts Commission and the Department of Planning and Economic Development establishes a methodology for evaluating potential sites through case studies that explore categories of public space and four actual locations throughout the city. Madison's city-culture is very engaged and hands-on. This how-to manual for artists and community residents who want to propose public art projects respects that culture and also establishes criteria that enables the city to evaluate proposals. One case study examines the re-design of State Street by Wallace, Roberts, Todd LLC with artist Brad Goldberg. Click here for the Field Guide methodology and case studies, a valuable tool for evaluating and designing public art for municipal sites. After art graduate school, I was fortunate to join the first cohort of professional public art administrators. Positions in Wisconsin and Minnesota enabled me to get to know the four corners of these states; any city, town or state park that was getting a new state building would also receive public art. “Percent for art” statutes establish the basic outline and aims for state-level public art programs. My challenge was to operationalize these well-intentioned laws with policies and procedures that functioned for diverse state agencies ranging from military affairs and corrections, transportation, natural resources, and administration, to state colleges and universities. I also executed projects for the Minnesota Historical Society, a quasi-state agency, and several large projects within the Capitol precinct under the jurisdiction of the Capital Area Architectural and Planning Board. These agencies and entities contracted with the arts board for my services to manage projects on their behalf, so maintaining relationships and ensuring procedures worked well for each of them, leading to high-quality outcomes, was imperative. Richard Fleischner, East Capitol Plaza, Minnesota State Capitol, Saint Paul. Paving, lighting, dimensional stone elements, benches and landscaping. Minnesota History Center, Saint Paul. Courtyard design by Andrew Leicester with turned ceramic columns featuring physical profiles of diverse museum visitors. I believe local control is critical and convinced arts boards that art committees should include not only arts professionals, the state project manager and design architect or landscape architect as voting members, but also local representatives. As a non-voting chair, I led committees through deliberations to define the public art “program” for their building, and after executing a call for artists, through the selection process and review of design proposals. It tested my leadership ability to get committee members of diverse backgrounds and experience with the arts, on the same page. My strategy was to raise expectations, and then meet or exceed them – and in most cases, we did. While public art programs must function well for client agencies, they also had to work for artists. As a practicing artist, I structured programs to enable artists, from emerging to experienced, to create their best work. The contracts I drafted and refined with the state attorney general’s offices were clear and balanced, and I became an active intermediary between bureaucrats, design professionals and artists during design, fabrication and installation phases. In addition to appraising the aesthetic qualities of artist’s design proposals, I became adept at evaluating materials and construction techniques, scheduling and installation details, and trouble-shooting maintenance issues. Each project presented an opportunity to refine policies and procedures, which led to the creation of a Technical Manual for the Minnesota program that has proven invaluable to subsequent administrators. In November 1994, I was honored to receive a Special Award for “dedication to the art of architecture and to art in public spaces” from AIA Minnesota, a Society of The American Institute of Architects. Winona (MN) State University Library terrazzo floor by Carolyn Braaksma and Brad Kaspari whose subject is the Mississippi River. Around the World on the 44th Parallel, twelve-panel ceramic tile mural by joyce Kozloff at the Mankato State University Library. Geography, street layouts and cultural patterns of twelve cities on the 44th parallel, including Mankato.